PIBO is particularly concerned with these species that are at risk. The Yellow-breasted Chat is a large, secretive warbler, which spends much of its time in dense vegetation such as thickets and scrub. It is thus not often seen, despite its bright yellow breast and throat. The Chat song is extremely varied and consists of a weird assortment of clicks, whistles and even “chuckling” sounds. Status: Endangered in Ontario, Special Concern nationally. Risk Assessment: The Chat is a species that depends on successional habitats with clearings that have become overgrown with scrub and thickets. These habitats have disappeared as a result of continued natural succession and land clearance for crops and development. One way to increase the availability of the Chat’s preferred habitat is fire management (prescribed burning). Chats may also face nest parasitism by Brown-headed Cowbirds (Molothrus ater), increasing partial or complete nest failure. On Pelee Island: Pelee’s Chat population is found in private and protected reserves. Since 2003, PIBO staff have monitored up to seven active Chat territories on the Island each year. Pelee’s Chat population may be small, but it’s significant – it may represent up to one-third of all breeding Chats in Ontario (Cadman et al. 2007). The Acadian Flycatcher is a small, olive-green songbird that has a pale eye ring, light-coloured wing bars and a short brown bill with a slightly hooked tip. Since the Acadian Flycatcher closely resembles other flycatchers in the Empidonax genus, it is best identified by its song, (“pi-zza”). This species’ preferred breeding habitat is the interior of large tracts of mature maple-beech forest, wintering in lowland tropical forests in Central and South America. It builds a distinctive hanging nest on a forked branch in a tree or shrub. The Acadian Flycatcher is an insectivorous bird, capturing insects on the wing. In Ontario, it is believed that there are fewer than 40 breeding pairs scattered throughout suitable habitat in the Carolinian Forest zone. Status: Endangered, both provincially and nationally. Risk Assessment: The major threat is habitat loss due to forest clearing and fragmentation. Other factors contributing to the risks have not been adequately studied and, therefore, are not fully understood. On Pelee Island: Several birds were recorded on territory in the Pelee Island alvar in the 1980s. Since then, several spring records exist of singing males around Fish Point. In 2012, PIBO staff observed multiple Acadian Flycatchers in May, even banding one! The Prothonotary Warbler is a small, brightly-coloured bird, with a yellow head and breast, olive green back, and blue-grey wings and tails. Prothonotary Warblers have very specific habitat requirements, preferring to nest in dead trees found in flooded woodlands or deciduous swamp forests, and wintering in mangrove swamps in Mexico and South America. They are also area-sensitive, avoiding forests less than 100 hectares in area. The Prothonotary Warbler is one of only two species that build their nest in a cavity, which the male will line with moss prior to nest-building. While Prothonotary Warblers are quite common in the United States, the Canadian population is limited to Ontario, and may consist of fewer than 30 individuals. Risk Assessment: The main threat Prothonotary Warblers face is habitat loss and degradation, resulting in fewer snags (dead trees) for the birds to build nests in. 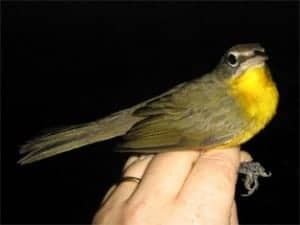 Prothonotary Warblers may also face increased competition for the remaining cavities from House Wrens (Troglodytes aedon), and nest parasitism from Brown-headed Cowbirds (Molothrus ater). On Pelee Island: In recent years, PIBO staff have monitored one to two breeding pairs in Fish Point Nature Reserve since 2010. The Pelee population in 2010 (two pairs) represented one-third of all known pairs in Ontario. 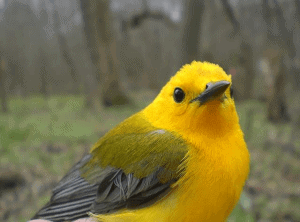 In 2011, PIBO staff observed 11 Prothonotary Warblers, and banded two (the offspring of the breeding pair). The Least Bittern is the smallest member of the heron family in North America – it’s the size of an American Robin! The small size of the Least Bittern combined with its exceptional camouflage abilities make it very difficult to spot, and as a result it is one of North America’s most poorly known species. Least Bitterns are found in wetland habitats with tall vegetation, which the birds will straddle, allowing them to forage for small fish and insects in deep water. The reeds and other aquatic plants also act as a platform for Bitterns to build their nests. The total breeding population of Least Bitterns in Canada is estimated at 1500 pairs, with most breeding pairs found in Southern Ontario. Status: Threatened, both provincially and nationally. Risk Assessment: Due to the difficulty of studying Least Bitterns, accurate historical population estimates are scarce, making it difficult to document population declines. However, the drainage of wetlands for agriculture and development is a major threat to Least Bitterns, who rely on large marshes with very little human activity. On Pelee Island: PIBO monitors many wetland habits on Pelee Island for Least Bitterns, as part of our Marsh Monitoring Program (MMP). There have been three active Least Bittern territories in Lighthouse Point Provincial Nature Reserve for many years. In addition to the MMP, PIBO has also been searching for Least Bitterns using audio recording devices placed in various wetlands on Pelee, which will allow us to detect the call of this secretive species. The Chimney Swift is often described as a “cigar with wings” because of its dark cylindrical body, short tail, and long, narrow wings. Chimney Swifts are excellent fliers, but their short legs do not allow them to perch, instead they cling to the walls of chimneys (where they nest and roost) and tree cavities. These birds are aerial insectivores, foraging for insects on the wing. Swifts are found across Eastern North America, and spend the winters in South America, roosting in caves, chimneys, crevices, and hollow trees in the Amazon forest. The Canadian population of Chimney Swifts is declining each year, estimated at just under 12,000 individuals, with the majority of those (approximately 7500) found in Ontario. Risk Assessment: Chimney Swifts have lost breeding and roosting sites as chimney construction has changed over time, and chimneys are replaced with furnaces. Another probable threat to Chimney Swifts is the decline of insect prey populations from pesticide use and changes in climate. On Pelee Island: There are at least two active nesting sites on Pelee Island, monitored yearly by PIBO. We also check potential roosting sites around the Island each year to determine if they are being used by Chimney Swifts. PIBO staff members also regularly observe Chimney Swifts in Fish Point Nature Reserve during migration monitoring in the spring and fall. The Bald Eagle is one of the most recognizable birds in North America, with its distinctive white head, neck, and tail contrasting with a dark body. Bald Eagles prefer habitats near water, as their diet is mainly made up of fish, though they will also eat small birds and mammals, and even carrion. They can also be found in urban areas near dumps, fish processing plants, and any other location where they can find a meal. Their nests are extremely large, and usually placed high up in a tree on a platform of sticks. While the Canadian population on average is stable, the Bald Eagle populations in Southern and Northern Ontario are still quite low. Status: Special Concern provincially, Not at Risk nationally. Risk Assessment: Historically, Bald Eagle population declines were due to reproductive failure caused by organochlorine pesticide use (such as DDT). Bald Eagles were also commonly shot, either as pests or trophies. Since the banning of DDT, and other protections that come with being placed on the Species at Risk list, populations across North American have rebounded. On Pelee Island: There are multiple active Bald Eagle territories on Pelee Island, some of which are monitored with the help of private landowners who find nests on their property. PIBO staff members regularly observe Bald Eagles during migration monitoring, particularly at the tip of Fish Point during the daily census. 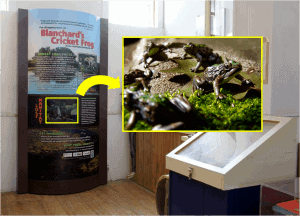 Blanchard’s Cricket Frog Display at the Pelee Island Heritage Centre, photos provided by display designer Scott Hughes. Blanchard’s Cricket Frog is a tiny member of the tree frog family that was formerly listed as a subspecies of Northern Cricket Frog (Acris crepitans). It has rough, bumpy skin, which is usually grey, brown, or olive coloured, and a distinctive v-shaped marking between the eyes. Blanchard’s Cricket Frog also has a unique call, the sound of which is described as “pebbles clicking together”. These frogs eat insects, and spend more time in or near water than most other North American tree frogs. Habitat requirements for the Blanchard’s Cricket Frog include large wetlands with few fish and sparse vegetation. These frogs have a wide range in the US, and can be found in many central States, however, historically in Canada they could only be found at Point Pelee or on Pelee Island. While still fairly common in the United States, the Canadian (Pelee) population is extremely small, even nonexistent, meaning Blanchard’s Cricket Frog is likely extirpated in Canada. Risk Assessment: Habitat loss and degradation is a major factor in the reduction of Blanchard’s Cricket Frog populations across North America. The undisturbed wetlands required by this species are becoming fewer in number as they are drained for agriculture or development. Further, aquatic invasive species (both plant and animal) can degrade any wetlands that do remain, making them unsuitable for Cricket Frogs (and other species). On Pelee Island: After the mainland (Point Pelee) population was extirpated in the 1920s, Pelee Island was home to the last Blanchard’s Cricket Frogs in Canada. However, the last (unconfirmed) sighting of this species on Pelee was in the late 1990s, and thus they are presumed to be extirpated from Pelee, and thus Canada. Beginning in 2011, PIBO partnered with experts from the Toronto Zoo to assess various wetland locations on Pelee Island that are suitable Blanchard’s Cricket Frog habitat. In 2012, we placed recording devices at these locations, to search for Cricket Frogs by listening for their call (along with multiple other amphibian species, and one bird – the Least Bittern). We had no confirmed Cricket Frog calls in 2012, but we will try again in 2013. To learn more about Blanchard’s Cricket Frog on Pelee, be sure to check out the new exhibit in the Pelee Island Heritage Centre when you’re on the Island!